Thirunallaru is in Karaikal,near Pondichery. Thirunallar is very famous for the shrine of Lord Shani (Saturn), Tirunallar Saneeswaran Temple is within the temple dedicated to Lord Darbharanyeswarar. As per legend to this temple, King Nala of Nidadha kingdom married the beautiful princess of Vidharbha,Dhamayanthi, in a swayamvaram arranged by the king. Lord Shani was desirous of marrying Damayanthi and since Nala married her, he became jealous and furious with him. As is the nature of Shani, if Shani enters into some one's life, they suffer ill hrealth, misfortunes and downfall in their life. Since Nala was very pious and never wavered from dharma, Shani could not get hold of him to trouble him. After a few years, Nala washed his legs to perform his morning pooja, did not wash his feet properly and left one his heels dirty and dry while cleaning rest of his feet.Shani who was waiting for an opportunity all these years, entered onto him through this dry ptach on his heel. Due to Shani's bad influence, Nala lost his kingdom in gamble and lost all his poverty. He became a pauper and started wandering around the streets with his family. He sent his sons to his uncles's house and went into a forest with his wife. As Shani's influence was high, he also left his wife in a lurch in the dark forest and went away. Dhamayanthi was later rescued by a king and was escorted her back to her parent's kingdom. Meanwhile, Nala while wandering in a forest, rescued a big serpent from a forest fire. The serpent called Karkodan, instead of thanking him, bit Nala, and Nala turned ugly because of the venom. The serpent Karkotan said that this transformation is for a reason and gave Nala a cloak made of serpent skin and asked to wear that in an appropriate time and it disappeared. Damayanthi, fretting for loss of her husband, asked his father to arrange for another swayamvaram hoping that Nala would come back. Nala cahnged his name to Vagunan and became employed as a charioteer to king Irudhupannan. Irudhubannan came to the Swayamvaram with Nala as the charioteer. As he was not allowed to participate in the swayamvaram, he went to the backyard and into the kitchen, where he saw his children and started playing with them. Damayanthi who happened to see this recognized this ugly man to be Nala. Realizing that the time has come, Nala wore the cloak given by Karkodan and the next instant he regained his real personality and became the beautiful king that he was. Becoming confident, he defeated king Putkaran and regained his kingdom all his properties back. Though he was united with his family and regained his kingdom, he was still feeling depressed. Sage Narada, who was visiting him said that his mental agony was due to the influence of Shani and asked Nala to take a pilgrimage. On his pilgrimage, he met sage Bharadwaja in Vrithachalam, a small town in Tamil Nadu, and the sage asked Nala to go and pray to Lord Shiva in the name of Dharparanyeswarar to get rid of Shani's influence. 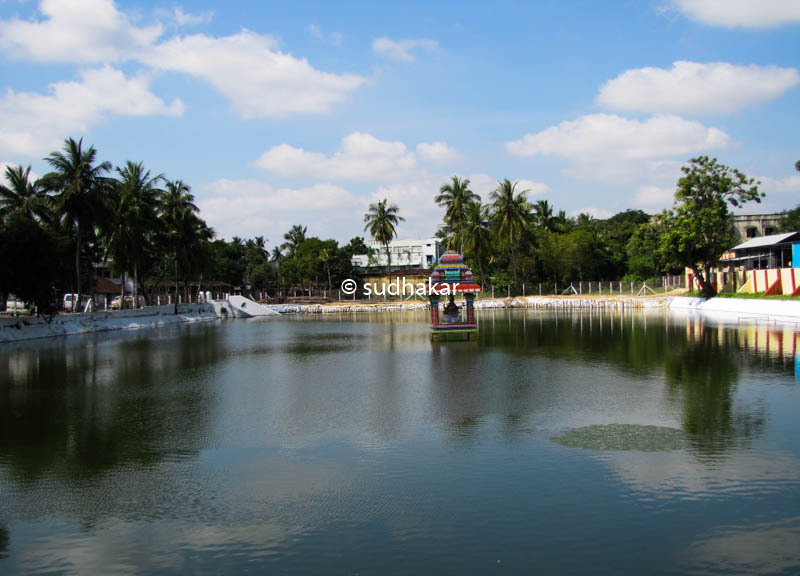 As soon as he entered Thirunallaru, he bathed in the tank and went inside the temple. Shani realizing that he should not torment Nala anymore and being afraid of Lord Shiva, went inside the temple and his himself in a corner. Lord Shiva, answered Nala and Dhamayanthi's prayers, bestowed them with all prosperity and happiness. He also found out the hiding Shani and told him that hencefort everyone entering the temple after worshipping him will also worship Shani and get his blessings.Since then, whoever comes to this shrine and seeks the blessings of Lord Shani, their influence by Shani is reduced and they are absolved of their miseries. Like Shani Shinganpur in Maharashtra, the temple here in Tirunallaru is a major temple in India dedicated to Shani God. 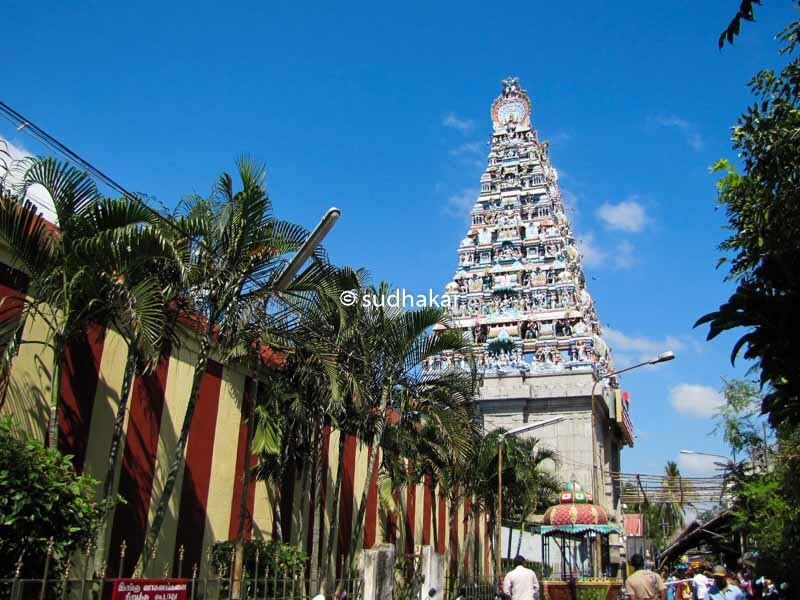 The temple has a large seven tier rajagopuram. As you enter past the nanadavanam (temple garden), Kalathinathan temple, sixty three nayanmar idols, a small sanctum for Nalan, you will reach the gold plated huge flagpost. (kodi maram). In front of this you can see the sanctum of Sri Dharbaryaneswarar, lord Shiva in the form of lingam which is a swayambu ( self originated). It is customary that you visit here first. There is a seperate sannidhi for ambal, Shiva's consort called here as Parameshwari, and Lord Subramanya with Valli and Deivayanai. The sthala vritcham ( the divine plant or tree of that sthala) is Dharba grass (kusa grass).Because of this, Shiva here is called Dharparanyeswarar. To the left of ambal's sannidhi is the sanctum for Lord Shani. Shani is the son of Suryan's second wife Sayadevi. He is also called as Saneeswar , Mandhan and Kaari ( as he is black in complexion). The sanctum is small and idol looks beautiful in the oil lamps. He is facing east and in most temples Lord Shani usually faces south. Another feature is that while most idols of Shani have four hands the idol at the Thirunallar Temple has only two hands. Since Lord Saturn is the main deity of this temple at Thirunallar there are no other sanctums for other grahas (planets).It is very crowded in Saturdays and during 'Sani peyarchi' ( when the saturn moves from one star to other). This temple was visited by the Saint Tirugnana Sambandar in the 7th century A.D. who sang padigams in praise of the Lord Shiva. Saint Tirnnavukkarasu and later, Saint Sundarar (9th century A.D.) had also visited the temple and sung padigams extolling the Lord. Saint Arunagirinathar (15th century A.D.) had also visited the temple and sung hymns included in his work Tiruppugazh. The main festival here is the sani peyarchi festival, celeberated during the period when Lord Shani is said to transit between stars. Holy Tanks The pilgrims have take a bath in the Nala Theertham, one of the bigger temple tanks in front of the temple, before offering prayers to the God. These rituals have been followed by devotees for years. Karaikal is well connected by rail, road and nearest airport is Pondicherry. Where to Stay?There are some budget hotels here.It is better to have Kumbakonam as your headquarters where you have plenty of budget, semi-deluxe and semi deluxe hotels. Places nearbyThe other eight Navagraha temples are in proximity to Thirunallar. Suriyanar Koil (for the planet Surya or Sun God), Kanjanoor (for the planet Venus or Sukran), Alangudi (for for the planet Jupiter or Guru), Thiruvenkadu (for the planet Mercury or Budhan), Vaideeswaran koil (for the planet Mars or Sevvai), Thirunageswaram and Keezhperumpallam (for the two snake planets) and Thingalur (for the Moon). Mayavaram, Kumbakonam and Pondicherry are nearby.